Wreaths Across America is an organization focused on honoring and remembering our veterans. Their mission is to Remember, Honor and Teach by coordinating wreath-laying cemeteries at Arlington National Cemetery and over 1,200 additional locations in all 50 states. A Tribute to the members of our family who served in the United States Military. Remember those who served. WWI: Gabriel Augustine Haggerty, Vincent Charles Lynam, Robert Edwin McDonald, Joseph Murosky, Sr.
WWII: Daniel L. Bukowski, Joseph R. Bukowski, Norbert Bukowski, Raymond H. Bukowski, John E. Chanis, Jr., Anthony Aloysius Fromknecht, Raymond Loll, Barbara Lynam, Robert Aloysius Haggerty, Ambrose Aloysius McDonald, Jr., James Aloysius McDonald, Edward V. Murosky, Harry A. Murosky, William Murosky, Benjamin Ragan Norris, Christopher D. O'Neill, Edward Charles Selker, Jr., Leopold George Selker, Jr., Philip Franz Selker, Robert V. Pietrzak, Edward W. Zelazny Korean War: John Bukowski, Jr. 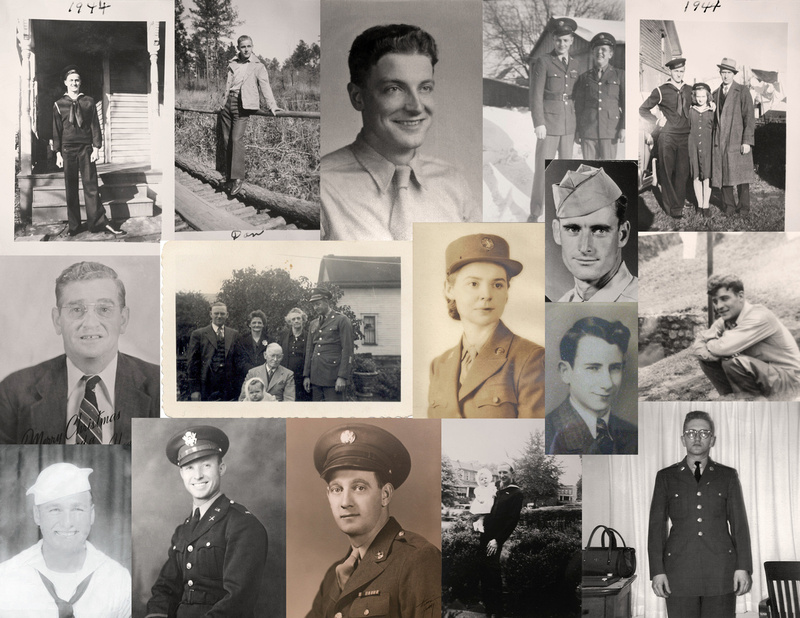 The collage of our Veterans was also uploaded to the tribute site. If you would like to learn more about the military veterans in our family and their service visit the Military Veterans Page. Are you interested in volunteering? Visit the Wreaths Across America to donate a wreath or to sign up to participate in a Wreath Laying Ceremony.